I spent the entirety of the week before last in a baking marathon. These brown butter apple almond cakes were just one of five different desserts plus a two-tier cake I made. I was tasked with creating and producing a dessert buffet for our friends’ Traci and Dan’s wedding. Traci loves good food and is an excellent cook herself. She had chosen to have her wedding catered by Boka, a restaurant group behind some of the best restaurants in the city including places like Stephanie Izard of Top Chef fame’s Girl & the Goat, Paul Virant’s Perennial Virant, Chris Pandel’s Balena, and Giuseppe Tentori’s GT Fish & Oyster. I had a tough act to follow. And while my kitchen is relatively large and well-stocked for an apartment, it isn’t exactly designed to produce food for a hundred people. I have a normal sized refrigerator, a single oven, a 5-quart KitchenAid mixer, a 7-cup Cuisinart food processor–nice but not commercial-sized equipment. And I’m just one person. With no staff. So figuring out how to create a sufficient quantity of wedding-worthy desserts that would work within those constraints, was, to say the least, a challenge. I had to be ultra-organized. I tested recipes over the course of a few months to figure out what would be feasible, portable, and result in a good mix of flavors and textures and create visual interest. I took copious notes. I totalled up how much butter (9 no, 10 pounds), granulated sugar (13 pounds), eggs (6 dozen), and so on I needed. I planned out what I would make each day in the week leading up to the wedding. Each day I tied my hair back with a bandana, put on some supportive footwear, donned an apron, prepped my mise-en-place, and worked. I had built a little time into my schedule for something or other to go awry, and, when to my surprise nothing calamitous materialized, I actually finished a little earlier than expected. Still, it was five-and-a-half long days of measuring, sifting, mixing, portioning, baking, cooling, wrapping, assembling, decorating–sometimes for 12 hours at a time. Something that’s easy to forget when you’re used to making desserts for a small household is just how physical baking is. There is so much lifting, bending, stirring, rolling out, cutting and heaving around heavy bags of ingredients. Doing something one time or even a few dozen times is nothing compared to performing the same motion a few hundred times. By the end of the week I was exhausted, both physically and mentally. But I was ultimately happy with how each dessert came out. They aren’t the flashiest of desserts, but these little round domes are rich and nutty and buttery with a refined crumb and toothsome bites of cinnamon-kissed apples and slices of almond. This particular version is gluten free (though you could make them with all-purpose flour if you prefer). The apples are roasted and half of the butter is browned with a vanilla bean ahead of time and allowed to cool. The batter comes together in the food processor and then it’s divided among the molds and dotted with apples and almond slices before it goes into the oven. Then the cakes get unmolded, and when fully cooled, they get dusted with powdered sugar. As a bonus, these cakes get even better if they sit for a couple of days, which makes them a perfect make-ahead dessert. And honestly, if you’re only making two dozen little cakes or a single larger cake–instead of the 96 individual cakes I made for the wedding–it comes together pretty quickly and easily. And they’re so worth it. I love these as individual cakes baked in molds like they're pictured here, but you can also bake it as one big cake in 9- or 10-inch round cake pan with at least 2-inch sides. 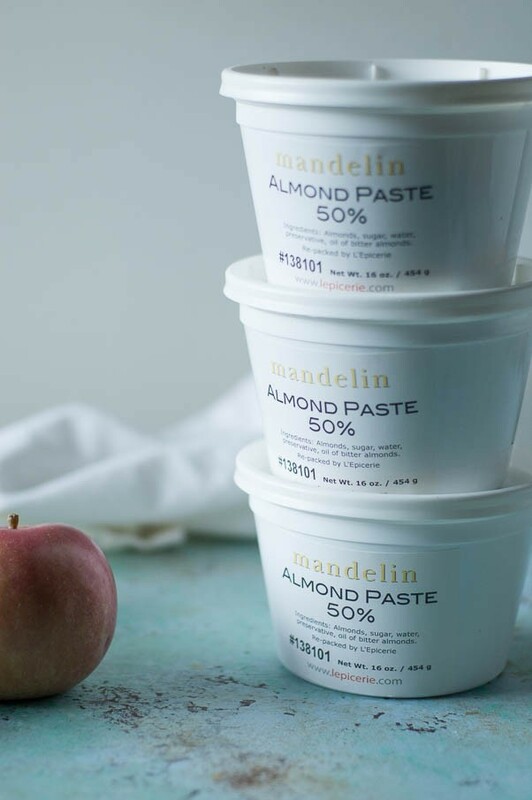 The most widely available almond pastes are Odense, which comes in a 7-ounce tube, and Solo, which comes in an 8-ounce box. 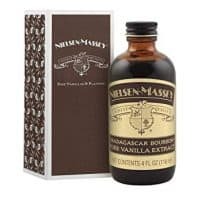 This recipe is flexible enough that either 7 or 8 ounces will work–so if you get the Odense, don’t feel the need to buy or open a second tube for the extra ounce. [EDIT: It’s just come to my attention that Odense almond paste is not gluten free–celiacs should use Solo brand or, like I did use Mandelin. A lesson to always read the ingredient list.] I like to brown the butter with a vanilla bean, which infuses the whole cake with an incredible vanilla essence, but if you don’t have a vanilla bean you can feel free to brown the butter without it. 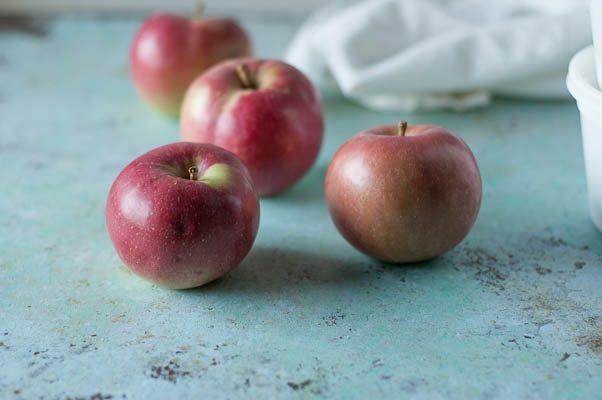 Use any sturdy baking apple you like–I used Ida Reds from Nichols Farm. I also like to use Calvados (apple brandy) to boost the apple flavor here, but you can definitely leave it out and have wonderful cakes without it if you don’t have any on hand. I used an all-purpose gluten free flour mix here. I’ve also made these successfully with extra-fine Thai rice flour. 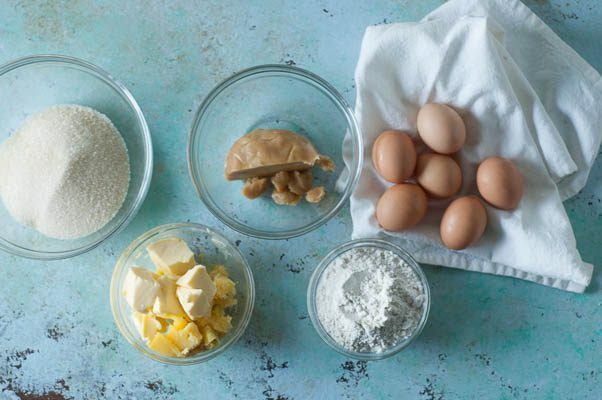 There are enough eggs in the batter to create structure without the need for xanthan gum. 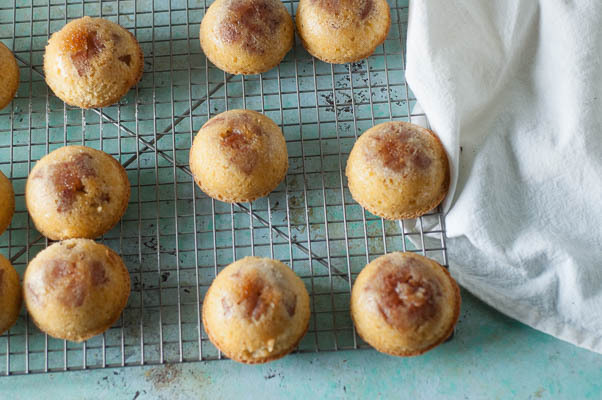 If you don’t have problems with gluten, you can also make these with all-purpose flour. This pushes the limit of the capacity of a 7-cup food processor, but it works. It will have plenty of room in a larger model, but won’t work in anything smaller. At least an hour before you want to make the batter, preheat the oven to 400ºF. In an 8 or 9 inch square baking pan, toss the apples with 1/3 cup of sugar and all of the cinnamon. Bake for about 20-25 minutes, or until the apples are soft. Let cool. Meanwhile, brown 1/2 cup of butter in a medium, heavy-bottomed sauce pan with the vanilla bean (if using) over medium heat. Cook, stirring occasionally, until the butter is fully melted, has foamed up and settled back down, and the butter solids at the bottom of the pan are deeply brown and smell wonderful and nutty. Transfer to a heat safe dish and cool in the refrigerator for at least 1/2 hour. Heat the oven to 325ºF. 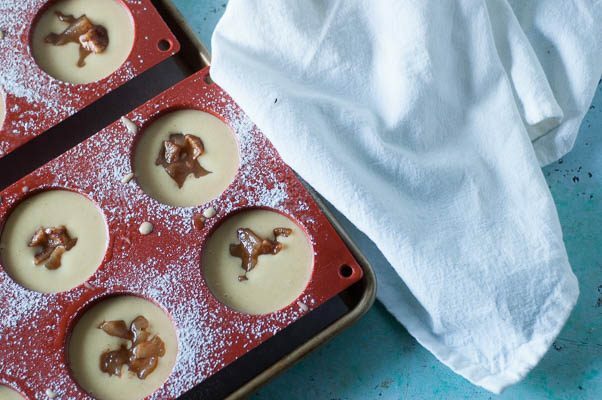 Spray your baking molds with nonstick spray and place on half sheet pans (or, if using a 9- or 10-inch round cake pan, spray with nonstick spray and line the bottom with parchment paper). Make the batter. In the bowl of a food processor, add the almond paste, the remaining 1 1/3 cups sugar, and 1/4 cup of the flour. Pulse until the mixture resembles fine crumbs. In a small mixing bowl, whisk together the flour, baking powder, and salt. Add the Calvados (if using) and vanilla extract and all of the butter (both the browned and not) to the food processor and process until smooth. Scrape down the sides of the food processor. Add the eggs, one at a time, and process until incorporated. Add the flour mixture and process until thoroughly mixed. Divide the batter between the molds, filling them about 3/4 of the way full (or pour into the larger cake pan). 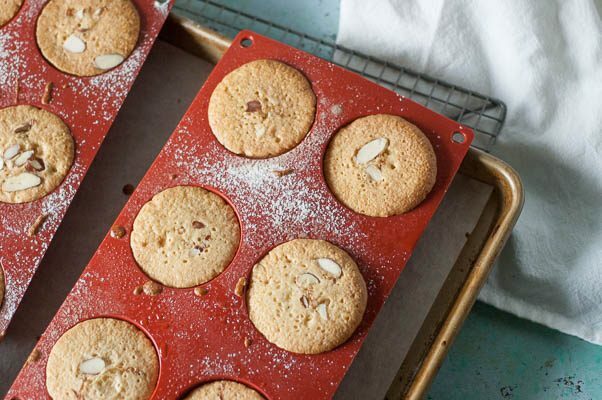 Add about a tablespoon of the baked apples to each mold and sprinkle on a few almond slices on each one (or drop the apples in spoonfuls across the batter and sprinkle the almonds over the surface of the cake). Bake until the tops of the cakes are deeply browned and the center feels set when pressed, about 30-35 minutes, rotating the pans from front to back and top to bottom after 15 minutes. (A larger cake will take about 50-60 minutes.) Let cool. Invert the molds onto a cooling rack, sprinkle with powdered sugar, and serve. The flavor improves if these sit for a day or two before serving. 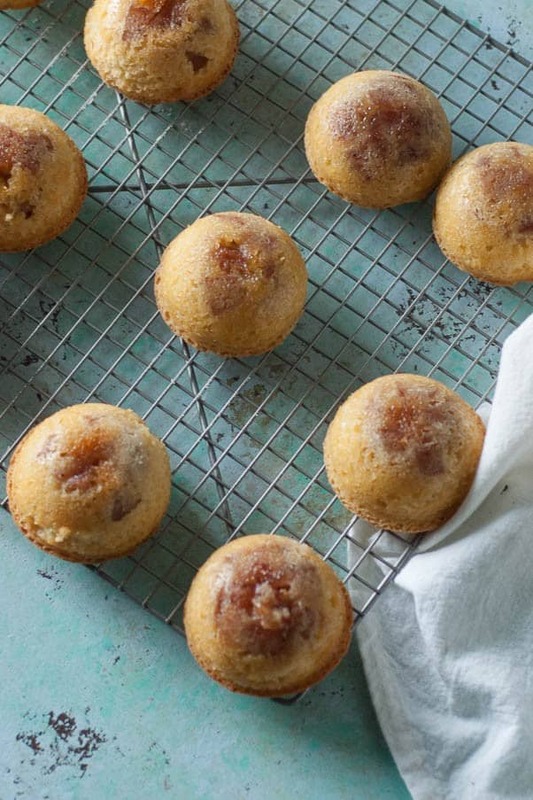 Don’t worry if the powdered sugar melts away. They’ll still look darling and taste wonderful. These keep in an airtight container at room temperature for about 5 days. Thanks Fareeha! I love these little cakes. This looks amazing! That’s awesome you got it all done! Thanks, Michelle! I hope you do try them! wow!! This looks fabulous. We need to make these! 🙂 Perfect for fall!! Thanks, Kare and Alex! Let me know how they turn out! Brown butter, apples, almond paste? Sign me up! Thanks for sharing this great recipe. Thanks, Callie! I’m powerless in the face of those flavors. Everything about this dessert looks great. It’s actually even really easy to make, so even better! Thanks so much! They’re really pretty easy to make. Karin, they are a little dangerous, but so worth it. Yum – thanks for sharing – they look and sound amazing! I couldn’t even imagine how to bake for a wedding or party let alone come up with such a fun mix of flavors! These look fabulous and I can’t wait to try them! Thanks so much! It was definitely a big challenge. I’ll be sharing more of what I made soon. These look tasty. Thank for sharing this recipe. They look amazing and well worth all of your efforts. Thanks, Jennifer! It was truly a labor of love.